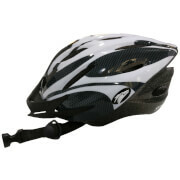 The Coyote Sierra adult helmet features 19 channelled airflow vents to force cool air in and warm air out. Coupled with an easy to use dial fit system and other comforts such as soft touch webbing, fully adjustable chin buckle and side straps ensures perfect custom sizing for every rider. 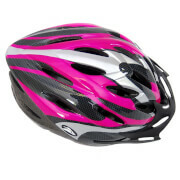 Its stylish aerodynamic design is enhanced with a detachable visor and striking colour schemes. Full in-mould construction. 19 airflow vents for full 360 degree venting. Adjustable chin buckle and side straps. Dial fitting system. Sealed inner pads. 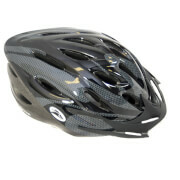 Mesh anti bug net front vents.. Detachable airflow peak. Sizes: Large 58-61cm. Medium 54-59cm. EN 1078 Compliant. Weight: 260g.